Asian American culture channel, SinoVision and blog, Beyond Chinatown interviewed Fina Yeung and me for the "Building Stories" show. We are so grateful for the support of the local media. Check out the interviews here! My first two woman show opens tomorrow night at the All Things Project Gallery (269 Bleeker St)! 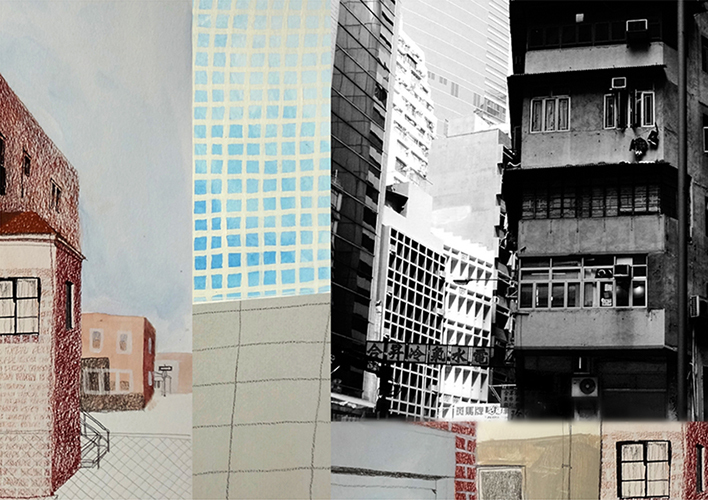 The All Things Project is pleased to present Building Stories, a two woman-show, featuring the mixed media on paper work of Naomi Kuo and the black and white photography of Fina Yeung. The patterns of shapes, lines, and textures in both of the artists’ work complement each other as they capture moments that impart a sense of personal and historical narrative, both lived and latent, in the architecture of neighborhoods in Hong Kong and New York City. The buildings themselves tell their stories, and the artists, having lived in these places, convey their own experiences with the buildings. Of her depictions of Long Island City and Astoria, Kuo states, “Specificity to place is important to each scene even as it accesses the universal, and observations of the public exterior world are made internal and personal as they are mediated through the process of drawing.” The series of photographs by Yeung retells stories about a city where physical space is scarce and the unique scenes created by new skyscrapers and old residential buildings stand side-by-side. Yeung states, “I have recovered my complex memories of Hong Kong, memories of feeling overwhelmed by the many shades of darkness in this glamorous city.” As diverse as these areas are, visual and social themes have taken up residence in the architecture, linking these places and yielding many moments of surprise, absurdity, loss, darkness, delight, and, sometimes, all at once. Both artists live and work in New York City. Fina Yeung has been living and creating art in Brooklyn since 2012. Her works have been exhibited in Rutgers University, the University of Medicine and Dentistry of New Jersey, BRIC Arts Media House, Williamsburg Art & Historical Center, and open studios in Brooklyn. Her paintings can be found in the Ronald McDonald House in New Brunswick, NJ (associated with the children’s hospital), and Bornean Sun Bear Conservation Centre in Malaysia. Naomi Kuo received her Bachelors of Art in English and Studio Art at the University of Texas in Austin in 2013. Since then she has been living and working as an artist in NYC, based out of Long Island City. Since 2013, she has been an artist-in-residence with Transform, the arts branch of Cru, a faith based non-profit.